After spending a weekend in wine country, I was hooked. I drove back the next month by myself in my camper van and spent a whole week exploring the winding country roads and rural vineyards of Paso. I was there in the spring, and the vibrant green colors, coastal fogs, and dew-covered hillsides was a joy to behold. 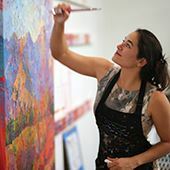 In the years that followed, I returned to Paso during the changing seasons every year, each time finding new colors and compositions to inspire a whole new collection of paintings. I love painting the rickety wooden fences, the rows of grape vines, and the ancient oak trees alive with character. I got involved with Studios on the Park, a local artists co-op and I did shows there every October for many years. 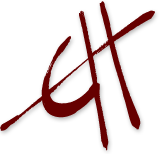 I continue to do exhibitions every year with local wineries. 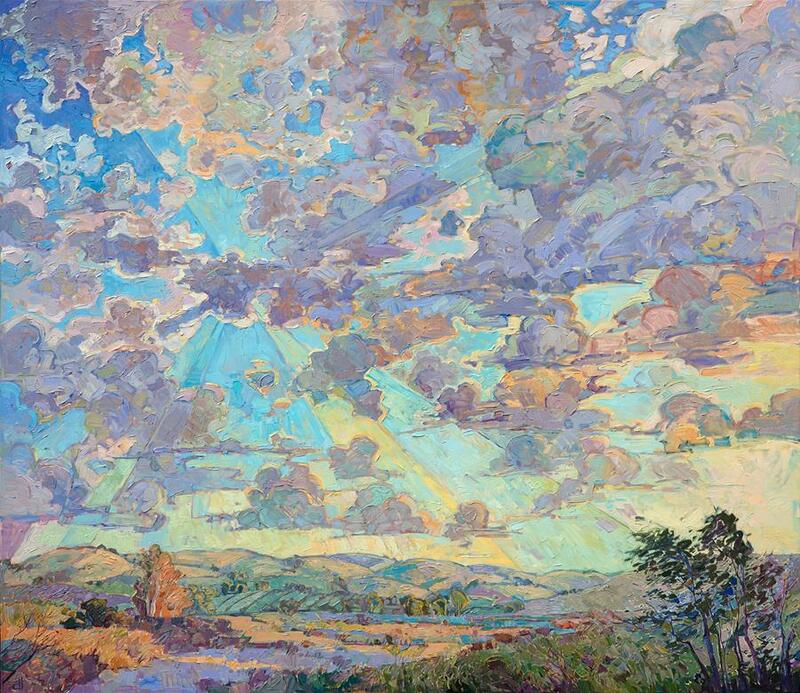 Send me an email to find out when I will be showing in Paso Robles next. If you have never been, it is definitely worth a visit! The food is incredible, the town is small and charming, and you will have a blast wine tasting and driving around the rolling hills and vineyards. 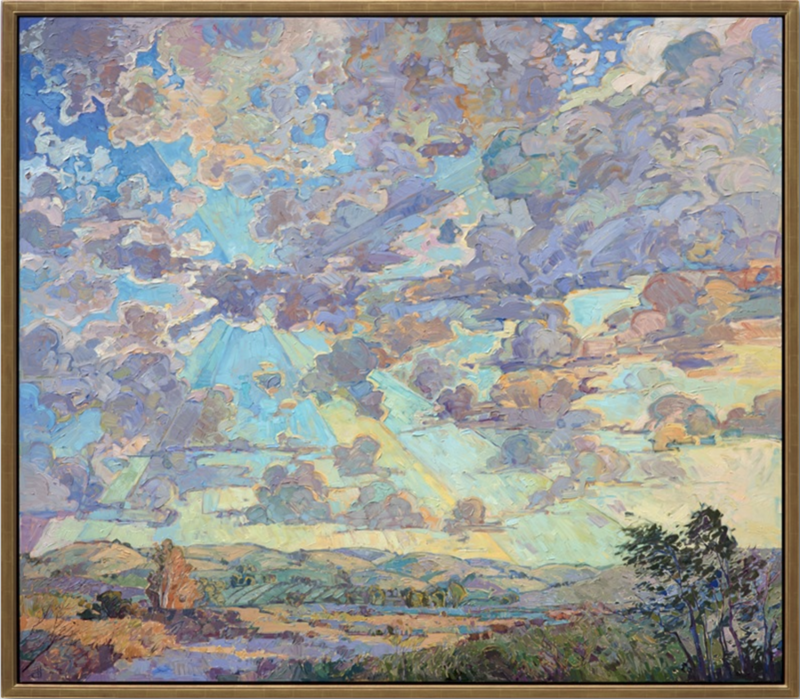 The painting "Open Skies" captures the low rolling hills of eastern Paso, with a dramatic sky breaking above the landscape. 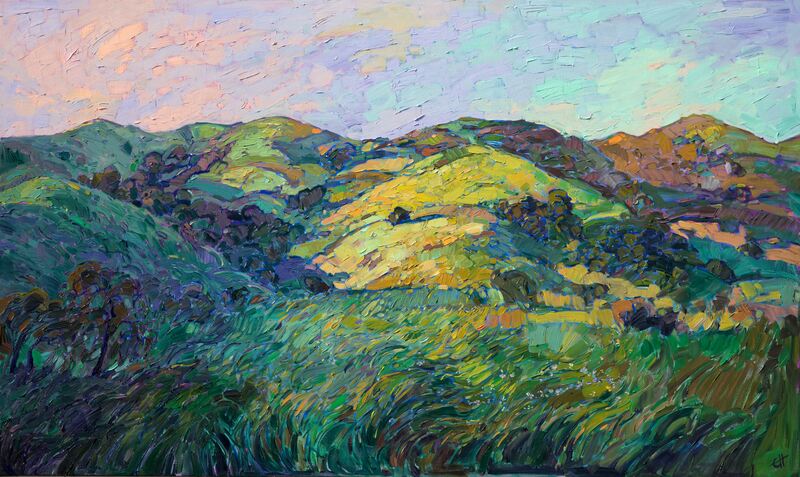 This piece captures the soft colors of late fall, when the rains bring forth a dusting of green grass across the summer-burnt hills. A grove of eucalyptus catches the warm afternoon light from the descending sun. This is a large painting - almost 7 feet wide and 6 feet tall. It creates quite an emotional impact when seen in person. The brush strokes are loose and impressionstic, conveying a sense of movement within the painting. Because of how the brush strokes fit together, the painting has a mosaic, or stained-glass appearance. 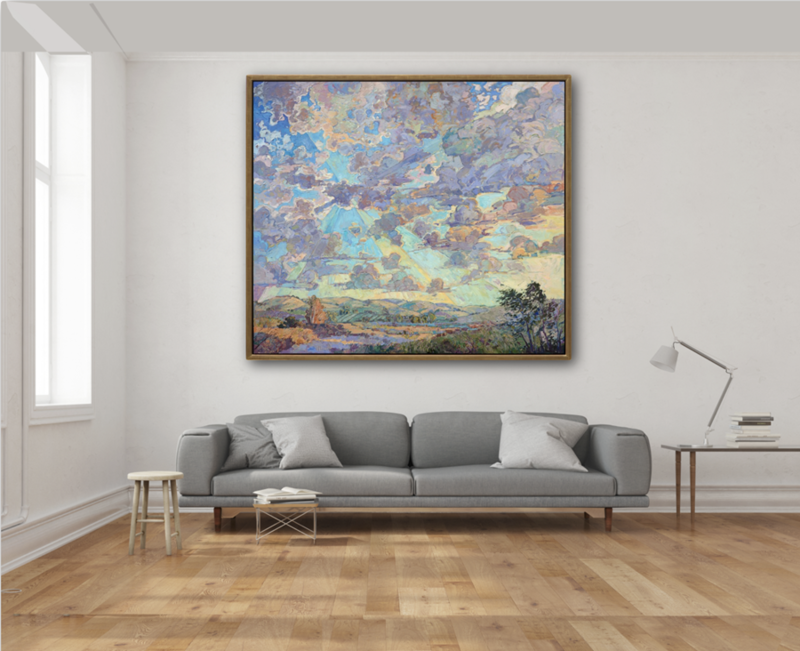 "Open Skies" is available to view in person at my gallery in San Diego. The piece has been framed in a soft gold floater frame. To purchase this painting, you can visit my website here, or you can email me or call my gallery at (858) 324-4644. I also have canvas prints available for this painting here.